Ideal Super-Concentrated Formulation: Delivers a proven, super-concentrated 1,030mg Omega-3 in a single fish gelatin softgel. 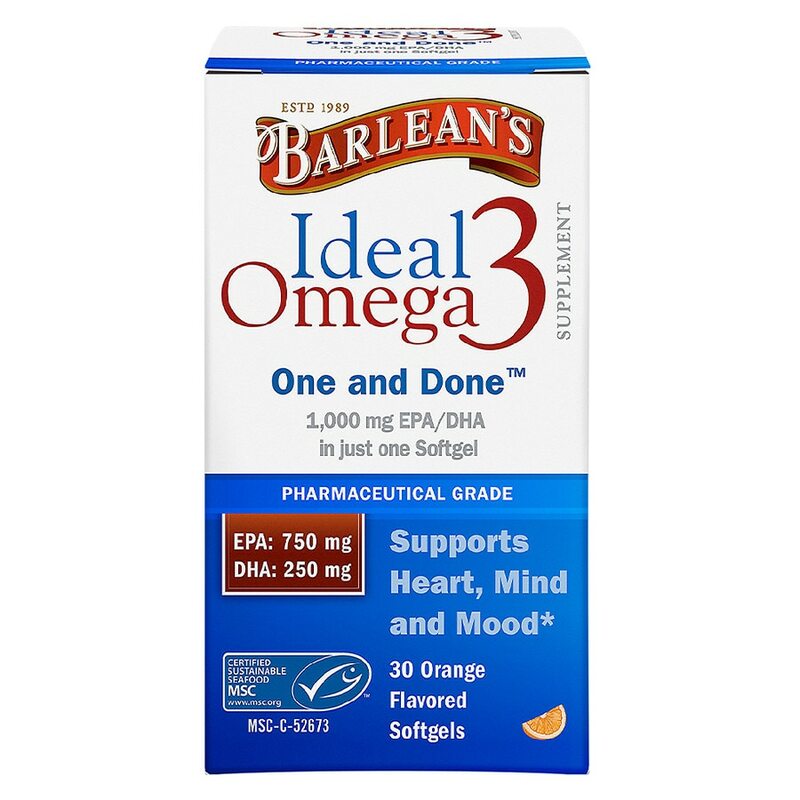 Ideal Freshness & Purity: Derived from fish caught in the pristine, icy waters of Alaska, pure and potent Barlean's® Ideal Omega has received the coveted 5 Star Rating from IFOS, an accredited third-party certification program. Ideal & Sustainability & Earth-Friendliness: Ideal Omega is certified to rigorous Marine Stewardship Council (MCS) standards, which ensure that marine populations and ecosystems remain healthy for future generations. Ideal Omega is clinically proven to increase Omega-3 levels in the bloodstream and muscle tissue of humans. Ultra-purified and molecularly distilled Ideal Omega has been designed to give you an optimal dose of super-charged Omega-3 in just one fish gelatin softgel per day. To learn more about the clinical effectiveness about the clinical effectiveness of Ideal Omega and find out how you can measure your own Omega Blood Count.